Traditionally these differences have been ignored with women being treated as “little men”. Research done on men or training and diet approaches developed by male coaches on male athletes are frequently applied uncritically to women and this can cause problems due to women’s physiologys differing in subtle (or not so subtle ways) to men’s. While the generalities will always hold, the specific of diet and nutrition that may work for men are frequently ineffective or even damaging to women. This is in addition to the absolutely staggering amount of poor information that exists on the topic of diet and weight/fat loss for women. This is either due to the immense amount of poor information in mainstream media or simply to how women have conceptualized how dieting for weight or fat loss should occur. Simply, many of the approaches that are recommended are used are either ineffective or detrimental to the fat loss process. The book examines not only women who are normally cycling but addresses other hormonal situations that a woman might find herself in. This includes hormonal birth control, Poly-Cystic Ovary Syndrome and sub-clinical hyperandrogenism (above normal testosterone levels) along with various types of menstrual cycle dysfunction including amenorrhea. The changes that occur with aging, both peri-menopause and menopause (both with and without HRT) are discussed along with partial hysterectomy (with estrogen replacement). These can impact on nutritional or dietary requirements and specific supplement recommendations are provided for each different situation. 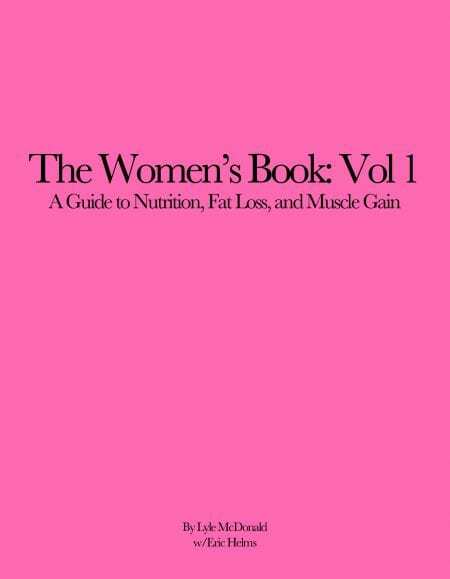 And The Women’s Book has, among it’s goals, providing the best information possible on how to optimize not only overall nutrition but the dieting/fat loss and muscle gain process. In addition to the physiological background, specific recommendations are given for fixing many of the problems women’s face, diet set up, meal patterning and frequency, around workout nutrition, estimating dieting times, identifying and breaking plateaus along many others. Basic exercise guidelines are given along with templates for women with different goals in different hormonal situations. The Women’s Book Vol 1 is a comprehensive reference and is the only one of its kind on the topic. While other books have certain been written, they are either aimed at a clinical audience or, when aimed at the general public are incomplete or contain incorrect or damaging information. The book is meant to be relevant to as many women in as many situations as possible. 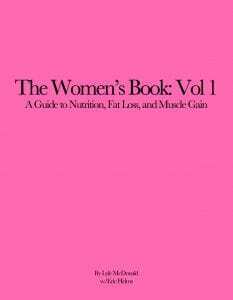 Whether lean or carrying excess body fat, whether beginner or advanced trainee, whether seeking general health or improved bone density, sports performance or dieting for a physique contest, the book will provide recommendations on how a woman can optimize them nutritionally (basic training information is provided).